Teachers have been camped out in front of Congress in protest of the Education Reform. There will be no deep social transformation in Mexico on the margins of the teaching profession. Even less against them. There will be no Fourth Transformation (4T) or a new Mexican school if it is intended to cage the teachers in an exceptional labor regime. Nor if it is intended to maintain the neoliberal educational project, even if it is made up. With the educational reform of Enrique Peña Nieto, the State broke, unilaterally, the pact that it had for decades with education workers. The reform substantially transformed the nature of teaching. He put the teachers, overnight, into the realm of insecurity and job insecurity. Teaching ceased being a State profession to become a semi-liberal profession, whose performance is subject to the discretion of the authority. On the way, he practically decreed the extinction of normalism . The new education reform is one of the essential aspects of the Pact for Mexico reform. This has been recognized by the PRI, the PAN and educational specialists from the business world. Therefore, they voted enthusiastically in favor of the ruling on the reform in the joint session of the Constitutional Points Commissions and Education in the Chamber of Deputies. It is false that the rejection of the democratic teachers of the National Coordination of Education Workers (Coordinadora Nacional de Trabajadores de la Educación, CNTE) of the deputies’ opinion is for the control of hiring (jobs). The CNTE has pointed out again and again, at every forum and negotiation in which they have participated, that they do not want the union to control hiring. Despite this, politicians and educational experts linked to the business world reiterate the slander. What the democratic teachers demand is not to be confined to any exceptional labor regimen that treats the labor rights of teachers as second-class rights. It considers unacceptable that income, promotion and recognition are administrative issues under government control, outside of any bilateral control. Not in the third article, nor in any transitory one. Nor does it admit that, although it is recognized in a transitory article that, except for admission, promotion and recognition, labor relations are regulated by section B of the constitutional article 123. For an elementary reason: for purposes of higher law, a transitory law is not above the mother law. Formally, the education reform of the 4T declares that it seeks to strengthen normalism. It does not do that. The text says: “The state will strengthen public institutions of teacher training, especially normal schools, in the terms provided by law.” The deputies butted horns over the original presidential proposal that establishes the priority attention to these institutions. Really strengthening normalism implies several things not contemplated in the dictum: giving positions to graduates of the public normales after finishing their studies; that graduates of these institutions have primacy to occupy a job over those coming from other educational centers; and, academic freedom and real autonomy. Normalism is a State profession, emerged from the obligation of the latter to provide education. It is the way of training the professionals who are required to comply with the constitutional requirements in the matter. The normalistas are evaluated by the educational authorities when they enter the normal, while they are in it and while obtaining their degree and their professional license. The curricula they study are set by the State. It is absurd that, instead of continuing the route that was followed successfully for many years, they don’t obtain their placement and immediately start working when they receive their professional ID. And that they must compete for a job with professionals who do not have the studies to teach children and young people. It is as if the cadets of the Heroic Military College, upon finishing their studies, instead of entering the service directly with a degree, had to take a new exam, competing with professionals who did not pursue a military career. The placement of new normalistas in the public system is not administered by the union. It is not the SNTE that gives them a position. The educational authority is the one that assigns them directly as graduates because their services are needed and because they demonstrated, throughout their entire career, that they are qualified to be teachers. With the new reform  it is impossible to establish any agreement between teachers and the State, or that a new Mexican school becomes a reality. To the contrary, as happened in the past six years, in which the legislators of the PRI assumed that “everything was under control” and faced intermittent waves of teacher discontent, what we will see is a permanent disagreement between education workers and the 4T. Normalism here refers to a system of teachers colleges (normales, in Spanish), such as Ayotzinapa, that educate teachers. Several days ago, AMLO issued a memorandum to the appropriate government agencies to stop implementing the application of the Education Reform. There is opposition from several sources and the final outcome of this memorandum is not clear. President Andrés Manuel López Obrador’s request for an apology from Spain because of colonization, is a simulation, “what they have to do is to stop dispossessing communities of their land,” the National Indigenous Congress (CNI) spokeswoman, María de Jesús Patricio Martínez, pointed out. On her visit through Chihuahua, the former aspirant to the presidency of the Republic insisted that the federal government deceives the citizens because it continues the dispossession and displacement of ethnicities in order to take possession of their territory. The Purépecha Francisco Reyes, who is also a member of the CNI, warned that in the government of López Obrador the situation for indigenous peoples could get worse because he imposes measures and actions with the justification that has the support of 30 million people that voted for his national project, according to what the local Chihuahua publication Raíchali published. Marichuy Patricio Martínez said that they are not going to stop fighting so that the customs of the peoples prevail and achieve an organization from below against the destructive actions of the megaprojects. The indigenous leader met with representatives of the mountain communities of Chihuahua, to listen to what has happened in the region since the start of the new federal government. “It’s about a tour to see how they are resisting and to know what they think about the new government,” she said upon arriving in the northern state. María de Jesús Patricio expressed her concern about the works announced, like the construction of the Maya Train (Tren Maya) in the country’s south, which they imposed “with a rigged consultation,” orchestrated by big capitalists that are the ones who dictate the direction of things, publishes the Chihuahua website. The CNI spokeswoman said that the change of regime would not come because that doesn’t depend on only one person, but rather on everyone. And, in the case of the indigenous communities, many have maintained their customs with their governors, form of organization, fiestas, traditions and a cared-for territory that they have known how to maintain. “We are justly fighting for that, for the respect of life on earth,” the added. In the specific case of Chihuahua, she referred to the huge problem clandestine logging in various zones of the state, like in the municipality of Bocoyna, in which the four wheels of capitalism against the indigenous communities are show: exploitation, repression, dispossession and contempt. She criticized that, in that case, the action of the authority had been contrary to the request of the residents, such as in the community of Bawinocachi, Bocoyna, in which the Federal Prosecutor for Environmental Protection (Profepa) placed responsibility on its residents for the clandestine logging that, since about a year ago, started killing off their forest. In the settlement agreement dated January 15, 2019, the federal agency notified them that it had opened an administrative process against them for alleged omissions they could incur by permitting deforestation, Raíchali published. “If they finish off the forest they are going to all of us,” María de Jesús Patricio insisted and emphasized the need to organize from below so that the people govern and also to prevent the destruction of the forest and the natural resources by the corporations or governments that want to impose businesses. Patricio Martínez reiterated that there are many communities that maintain their customs and their form of organization. The funeral of neoliberalism was decreed, but we do not know which corpse they will bury. President López Obrador once again showed his desire to liquidate the neoliberal era, to which he rightly attributes a large amount of the troubles that overwhelm the country. His conviction is clear. But his personal definition of the enemy jeopardizes his intentions. López Obrador seems sure that exiting the neoliberal world will be enough to retake the State leadership. It is true that renouncing the basic State functions to give them away to private corporations, in a way as corrupt as incompetent, is one of the worst mistakes of the Mexican governments since 1982. But before celebrating the recovery we need to know the meaning. It seems that everything changes… for nothing to change. This State leadership is used to giving away public programs to corporations and adopting the path that they are indicating. One of the clearest examples is the Isthmus of Tehuantepec. It is said loud and clear that the new plan satisfies the national interest and generates wellbeing for the people of the region. Nevertheless, even the most superficial analysis of the plan´s contents, shows that it is a dispositive that inserts the country more deeply in not it´s own logic, but into the one of private interest. It constitutes a very real threat to people in the region, because it endangers their ways of life, their traditions and their hopes. When Porfirio Díaz created the idea for the first time, it seemed viable that Mexico to strategically use the project, which awoke huge interest among the Americans. At some moment of tension with the United States, Díaz Ordaz discovered that large portions of the Isthmus were in foreign hands, so he organized a massive distribution of ejido and communal lands as a pretext for expropriation. It was too dangerous for Mexico that these lands were not our own. When López Portillo thought that it was his turn to administer abundance, he ordered the preparation of the project in order to invest petroleum profits in it. The project was very advanced when they discovered that they had run out of money and the risks were too high. Today, under entirely different conditions, they seek to reorder activities on the Isthmus in order to connect it to an operation that only big corporations could assume and in order to cancel an autonomous path. The protocol of the process of the free, previous and informed consultation for the peoples and indigenous communities of the Tehuantepec Isthmus in Oaxaca and Veracruz, regarding the Development Program for the Isthmus of Tehuantepec  is a document that deserves a careful consideration. It is an exemplary case of the forms of the state of siege (State of emergency), when the law is used to violate itself, to twist itself. It describes the pertinent legal dispositions for the case and finds solace in the legal value of good faith, to right afterwards describe the way in which people will be betrayed in spirit and in word. The consultation that was made in a hurry and will end on March 31 is not even “previous”. The government has already made the decision to do the program. Their actions haven´t even reached the communities involved, but decisions have been made that will affect them. Every day contracts and commitments are announced. It’s urgent for the government to process the 5 billion dollars that were promised to Trump for the area. The most awful thing about this consultation is that it only “informs” about the government’s program so that the people take it or leave it without presenting options. The only way of make this consultation valid is allowing the people to choose what they really want. The operators of the mechanism of civic participation will give good news to the president by the end of the month. He would “win” another one. They will affirm with all cynicism and ignorance, that the program it is made with civic participation and in accordance with the principle of “mandar obedeciendo”  (to govern obeying). The result will be used as “proof” that the peoples just want to access the forms of capitalism that prevail in the north, leaving behind their “underdevelopment”, as some of the organic intellectuals of the new government affirm. Now comes the answer of the peoples. It has already been announced in Guelatao, when the people AMLO drove-in (acarreados) surpassed the locals to honor Benito Juárez. He will not wait. According to reports in the press, the Development Program for the Isthmus of Tehuantepec, aka the Trans-Isthmus Corridor, is a project to revitalize the existing single-track railroad between the port of Coatzacoalcos (Veracruz) and the port of Salina Cruz (Oaxaca). The existing railroad would be upgraded to a high-speed railroad with two tracks that would carry freight between the Gulf of Mexico and the Pacific Ocean, thus providing a Panama Canal-lite and facilitating trade with China. Both ports are designated Special Economic Zones, tax-free zones for trans-oceanic commerce. The Mexican government believes that this mega-project would promote “development” in the region and provide jobs, not only for the local population, but also for migrants from Central America. See the CNI-CIG and the EZLN’s communiqué about the referendum here. Mandar obedeciendo is a set of principles for governing and leadership that are practiced by the CNI-CIG and the EZLN. Upon completing the first 100 days of the new government, it’s concerning that its ex oficio lawyers make targeted statements about those indigenous peoples, who from their knowledge and anti-capitalism, denounce and resist the renewed development, neo-indigenist and militarization policies of the Fourth Transformation. The EZLN and the National Indigenous Congress-Indigenous Government Council were not responsible nor were the “isolated voices” of the “Zapatista environment” for the fact that President Andrés Manuel López Obrador would ratify the PIM (Proyecto Integral Morelos, Morelos Integral Project) in his speech in Cuautla on February 10, in which he reversed his public commitments in 2014 and 2018, and in which he stigmatized “leftist radicals,” and classified them as “conservatives,” without distinguishing that, in reality, they were members of peoples and communities that for years have been waging an unequal battle against the PIM, and, now, paradoxically against the new government, that defends and represents said project. The murder of Samir Flores Soberanes, the very incarnation of that struggle, took place ten days after the presidential harangue. Pointing out, as does Armando Bartra, that it seeks to make political use of this death to “feed blood to a cause that doesn’t need it” is trivializing that murder and an unsustainable political infamy. Samir is a symbol of the struggle of the peoples that remember with admiration and respect their teachings. 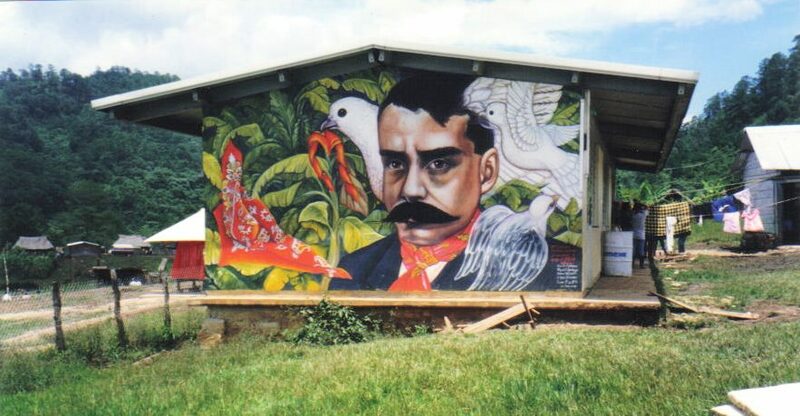 Amilcingo, his birthplace, becomes the epicenter of mobilizations like the Emerging National Assembly versus State Violence and Self-determination of the Peoples, held on March 9, in which the current government was characterized, in fact, as a continuity of neoliberalism, calling for a national and international mobilization next April 10 in Chinameca, and declaring AMLO a “persona non grata” in Morelos: “We will not permit –participants in this assembly assert– that the death of our caudillo of the south is insulted with the presence of one who seeks to impel death projects on Zapatista land.” The resistances to the PIM could be repeated with the Maya Train, the Tehuantepec dry canal and other megaprojects at the doorstep. The apologists of AMLO’s achievements in his first 100 days seem to not take into account the unavoidable reality of the profound gap between the original peoples and a government that already decreed the end of neoliberalism, in the “100 days that moved Mexico” (sic). Of course, as indigenous peoples organized in defense of their territories and their autonomic processes, it’s not a priority on the governmental agenda, except when it refers to the National Institute of Indigenous Peoples (INPI), which as of today has not made one single statement about the Morelos Integral Project and the continuity of the violence against those who struggle in defense of Mother Earth, like Samir. The INPI is carrying out consultations in communities formally comply with Convention 169 of the ILO, although Victoria Tauili-Corpuz, the UN’s special relator on the Rights of Indigenous Peoples, already firmly expressed her concerns to the current government about the obligations contracted in this regard by the Mexican State, in accordance with the constitutional context and the international treaties in effect. Also, from the ambits authorized, difficult of being accused of “conservative” and “ultra-leftist,” emerge critical observations that coincide with those sustained by community resistances. Greenpeace lamented the little attention of the current government, “beyond the discourse,” to the theme of the environment, and evaluated that in just 100 days of government President Andrés Manuel López Obrador’s policies –on environmental and energy matters– profile Mexico in the direction of a climate disaster. Among the five points on which such affirmation is sustained, specifically, the reactivation of the thermoelectric plants, like the one in Huexca. Within this context of authoritarianisms from the power: To what hypothetical dialogue does Bartra refer and who is hindering it when consultations are imposed from the federal Executive that have been considered illegal, illegitimate, in violation of the collective rights of the original peoples? Is it dialogue with the delegate of the Presidency of the Republic in Morelos, Hugo Éric Flores, a systematically questioned operator that harassed the dignified people of Huexca with his presence on the night of last March 5, without being invited by a community assembly, accompanied with public force, and offering patronizing and corporative aid that seeks to buy consciences and, that yes, fraction and divide communities? Is it dialogue with the prosecutor that “investigates” Samir’s murder, insulting his memory and the ethical integrity of the atmospheres of family and struggle? Is it dialogue with one who only listens to the echo of his word made law?